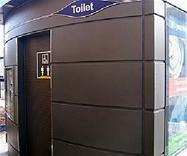 With new toilets for public use now available in Linlithgow Partnership Centre and further public toilet facilities also available close by at Linlithgow Burgh Halls and the Water Yett, the toilets at the Vennel are now closed. Free facilities will be available during the opening hours of the centre at Tam Dalyell House, High Street, Linlithgow, EH49 7EQ. The free toilets at Linlithgow Burgh Halls, The Cross, EH49 7AH are also available Monday to Saturday, 9am - 5pm, and from 11am to 5pm on Sundays. Automated facilities are also available on a 24/7 basis at the Water Yett, off the High Street, EH49 7ER, with a small 10p entrance charge for use.